About 5.5 cm high x 9 cm wide. of footed form with trailed decoration. Of onion form with spiral fluted and purple speckled decoration, Unique Collection. About 11 cm high x 10 cm wide. This is a John Ditchfield iridescent petroleum feather vase. Lovely color and shape. The iridescent petroleum body is decorated with feather shapes. Etched on the base: J. Ditchfield GLASFORM 5284. This is a John Ditchfield for Glasform iridescent glass vase. Etched on the base: J. Ditchfield GLASFORM 6058. Also bears the paper label (photos). Excellent original condition. 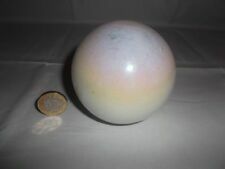 Rare John Ditchfield/Glasform spherical Paperweight. Etched and labelled on the bottom PW119. In perfect condition. Signed John Ditchfield iridescent glass vase. About 12 cm high x 13cm wide. About 9 cm high x 7 cm wide. About 18 cm high x 13 cm wide. of slender necked, globular form, with fluted and wavy banded decoration. 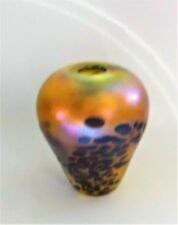 Signed John Ditchfield iridescent glass vase, circa 2011. of ovoid form with bonded and fluted decoration, Unique Collection. About 14 cm high x 12 cm wide. 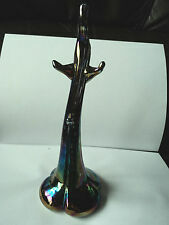 Signed John Ditchfield iridescent glass vase. About 29 cm high x 13 cm wide. JOHN DITCHFIELD GLASFORM. Beautiful iridescent Large Bowl with Millefiori and Trail Decoration. Numbered 5907. Ditchfield purple vase decorated with gold and silver aventurine finish. Numbered 3792 and signed to the base. I have photographed with a tin to give an idea of scale. This is a lovely glasform Frog by John Ditchfield, he is well known for that petrol on water effect. For your consideration is a stunning Glasform John Ditchfield glass bauble.This highly decorative and generously sized example features a trailed decoration interspersed with millefiori canes. This is a John Ditchfield petroleum glass vase. Lovely color and shape. The iridescent petroleum body is decorated with surface speckles. Etched on the base: J. Ditchfield GLASFORM 5909. Also has paper label (photos). This is a John Ditchfield for Glasform iridescent glass vase. Etched on the base: J. Ditchfield GLASFORM 6248. Also bears the paper label (photos). Excellent original condition. He was the youngest of three. He had been given spending money for the two weeks but blew it all on purchasing the set of pieces for his mother. So began his love affair with glass and under the tuition of Toffolo he spent seven years learning the basic and complicated techniques of Venetian glassmaking. This is a John Ditchfield blue petroleum glass vase. Lovely color. Decorated with trails. Etched on the base: J. Ditchfield GLASFORM 5461. Also has paper label (photos). Excellent original condition. FOR YOUR CONSIDERATION IS THIS DELIGHTFUL IRRIDESCENT GLASFORM J. DITCHFIELD IRRIDESCENT JEWELLERY STAND / RING TREE. SIGNED TO BASE AS SHOWN. WOULD MAKE A STUNNING GIFT, OR PROP FOR A JEWELLERS. This is a John Ditchfield blue iridescent glass bowl. Lovely color. Etched on the base: J. Ditchfield GLASFORM. Also bears the paper label (photos). Excellent original condition. This is a John Ditchfield blue petroleum glass vase. Lovely color. Decorated with trails. Etched on the base: J. Ditchfield GLASFORM 5389. Also has paper label (photos). Excellent original condition. MADE BY JOHN DITCHFIELD AT HIS GLASFORM STUDIO. SIGNED J DITCHFIELD GLASFORM 5400 ON THE BASE. A LOVELY LARGE VASE CLEAR WITH A IRIDESCENT PALE LILAC TINT AND SWIRLS DECORATION. Large Ditchfield art glass apple paperweight with silver stalk and leaf. Glasform sticker on the base although it is faded due to the age of the apple. Beautiful blue irridescent colour flowing through greens and pinks. The condition of the vase is as fresh as the date of manufacture. The ground & polished base of the vase is etched-inscribed with a full set of marks in cursive script: Glasform 7177 J Ditchfield. This is a large & impressive vase produced in England during the late 1990s by John Ditchfield. JOHN DITCHFIELD. 'Iridescent Round Paperweight'. Signed to the base. We hope they satisfy you as to the detail and condition of the item for sale. This is a John Ditchfield large petroleum glass globular vase. Lovely color and shape. The iridescent petroleum body is decorated with speckles and swives. Etched on the base: J. Ditchfield GLASFORM 5910. "J. Ditchfield GLASFORM 5181". Pink Irridescent Glasform with label. John Dtchfield Glass Vase number 5181. John Ditchfield Glass Baubles x 3. sizes 4" - 5". A rare pair of John Ditchfield/Glasform spherical Paperweights. Etched and labelled on the bottom. In perfect condition. John Ditchfield Glass Paperwight in the form of a snail with a mans face. petrolium blue. size 7" x 3.5" hi. A rare pair of John Ditchfield/Glasform spherical Paperweights. Etched and labelled on the bottom. Both are PW100, they are not identical as Ditchfield's pieces are unique, but they are very similar. John Ditchfield Glass Baubles x 3. size each 5". John Ditchfield Glass Baubles x 2. size each 5". This is a John Ditchfield for Glasform iridescent glass vase. Etched on the base: J. Ditchfield G.F (for GLASFORM) 6753. Also bears the paper label (photos). Excellent original condition. This is a John Ditchfield for Glasform iridescent glass vase. Etched on the base: J. Ditchfield GLASFORM5913. Also bears the paper label (photos). Excellent original condition. JOHN DITCHFIELD GLASFORM. numbered 5586 to the base. Beautiful iridescent Petroleum Bowl with Swirls decoration. 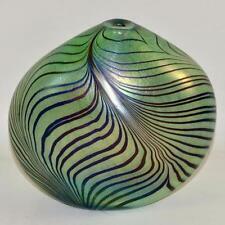 Rare John Ditchfield/Glasform spherical Paperweight. Etched and labelled on the bottom PW116. In perfect condition. This is a John Ditchfield iridescent petroleum lava vase. Lovely color and shape. The iridescent petroleum body is decorated with surface bands and lava decoration. Etched on the base: J. Ditchfield GLASFORM 5274. GLASFORM OIL ON WATER RING / JEWELLERY. SIGNED GLASFORM TO BASE. SCARCE GLASFORM PIECE. YOU ARE VIEWING A GORGEOUS, SIGNED. The outside is matt with a Celtic knot pattern etched into a shiny black strip that extends 3/4 of the way round the bowl. It has Lazlo's etched signature on the base. I understand that he had to retire from glass making through ill-health.